I may be devoted to Mid-Century style now, but my first true architectural love was High Victorian Gothic – the kind of heavy, massive, overly ornate, slightly surreal stuff that Frank Furness imprinted on the Philadelphia area and imparted to Louis Sullivan before the latter decamped for Chicago. 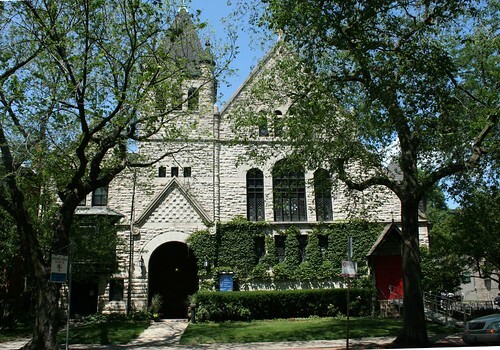 I was introduced to it through the late Tudor Gothic Revival style of Washington University’s campus, and became intimately acquainted during a three-year stay in Philadelphia. 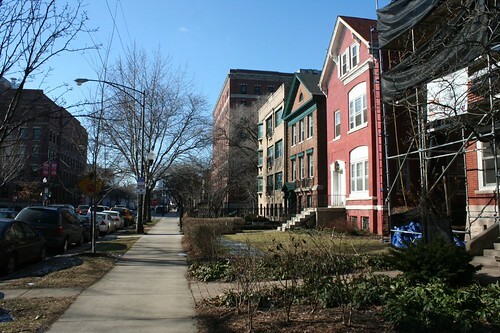 You never forget your first love, and so I am deeply stirred when walking down the 500-600 block of West Fullerton Parkway. 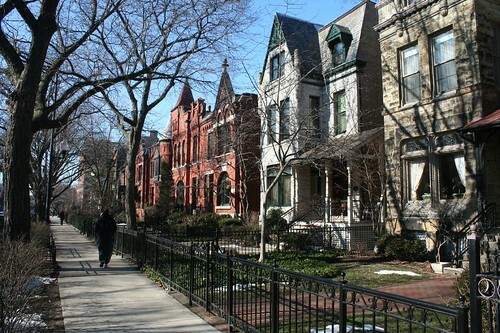 For my money, these two blocks comprise the most beautiful street in all of Chicagoland. 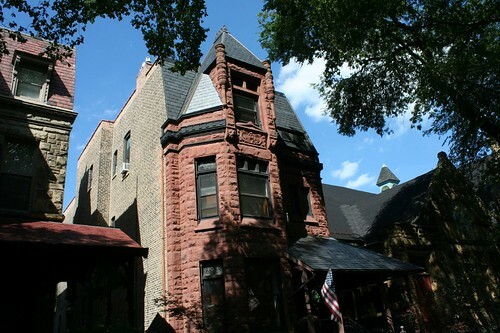 The green stone Gothic house at left is 616-618 W. Fullerton. 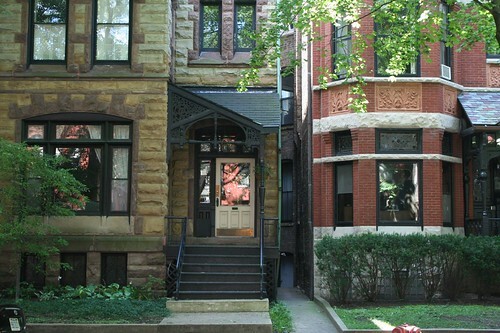 626 W. Fullerton (left) and 620-624 W. Fullerton – the centerpieces of the block (650-646 under the pre-1909 numbering scheme). 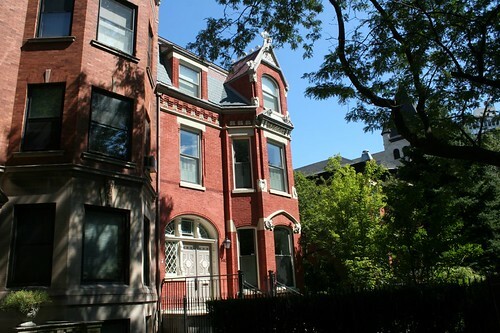 624 was home to Dr. & Mrs. Clarendon Rutherford in the 1890s into the 1920s; in the 1950s , a doctor at nearby Children’s Memorial Hospital resided there. 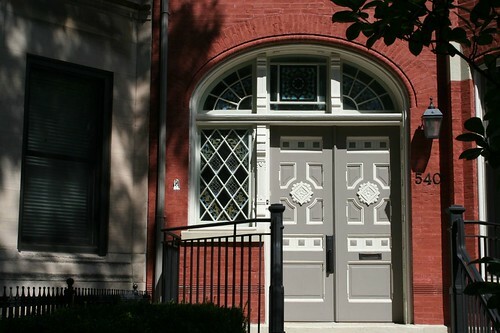 In the 1920s Mr. Louis O. Kohtz, resident of Chicago since the 1860s, lived next door at 620. Oh, there are plenty of close competitors, some right in the same neighborhood. The parallel streets just north and south, for example, offer similar scale and architecture. 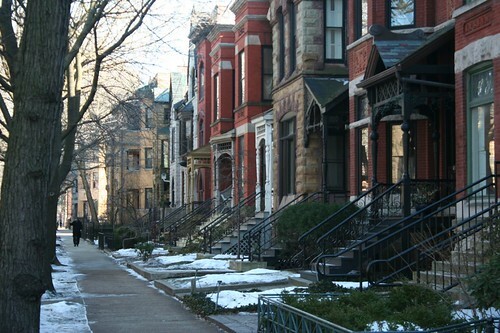 I could cite other streets in Old Town, near DePaul, in Rivernorth, Little Italy’s Taylor Street, Roscoe Village, even Jackson Boulevard east of Ashland. Yet too often these streets are violated by later intrusions, which may be of interest themselves, but tend to detract from the overall effect. 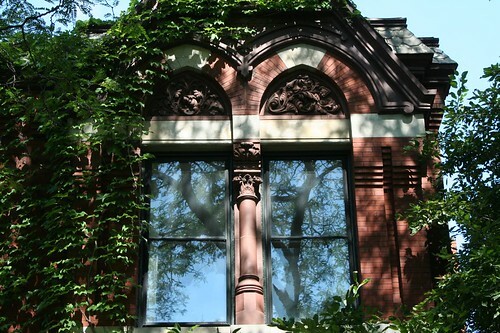 On 500-600 Fullerton, by contrast, you can – however briefly – submerge yourself in an architectural dream straight out of the 1880s. And it’s only those two blocks. Just east, a massive 1960s apartment tower shatters the ambiance, and Clark & Fullerton is crazy, lively, bustling, thrilling, but not especially beautiful. In the other direction, the trees run out, and the hulk of Children’s Memorial Hospital is even more of a period architecture buzzkill. What is it about these two blocks? Trees, for starters. 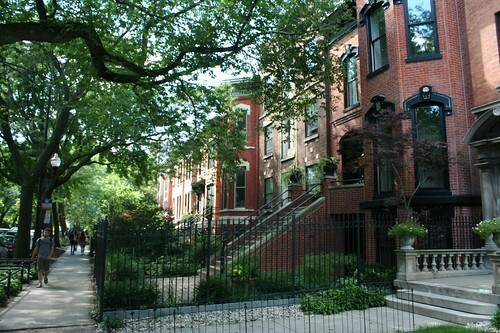 No city block can be truly and completely beautiful without mature shade trees. Fullerton has them in abundance – massive, tall and aged, they gently shelter the sidewalks, forming a roof over the outdoor space. For pure picturesque beauty, great trees are vital for a great street. The western point where the shade trees end is exactly where the two-block dream world also ends. The trees are supplemented by a wealth of greenery on the ground – bushes and miniature gardens abound, amply demonstrating that a yard does not need to be large to be beautiful. Next is the architecture. 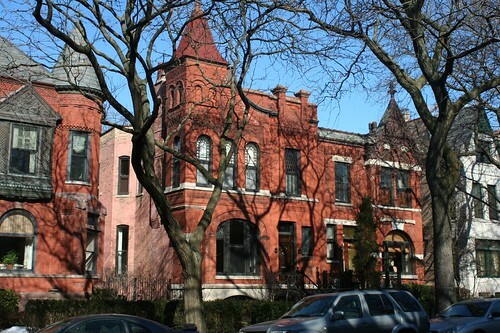 It is all of a period, though it is not of a single style – it is a mish-mash of ornate, elaborate Gothic derivatives, Romanesque, and Queen Anne, with twoPrairie Style apartment houses thrown in for good measure. Hints of the influence of Richardson, Furness and Sullivan can be seen. Queen Anne woodwork gives many homes elaborate porches and entryways. 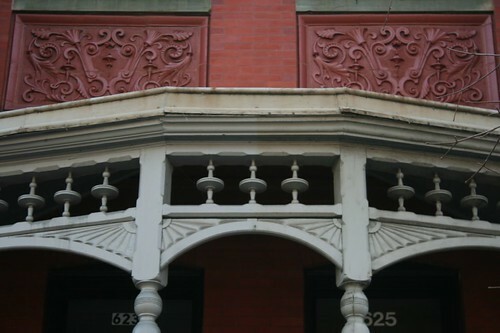 Terra cotta detail abounds, from floral ornament to sculpted lintels. Porches and stoops provide a welcoming, layered approach to each house. Public, semi-public, semi-private, and private are all delineated in the space of a few feet. No one can own a house here without being aware of how his house contributes to the whole, and how much much the whole enhances the value of his own property. Houses follow a common setback line, a common entry height. The entries themselves are elaborate and inviting. This is urban design par excellence. Both of which will be covered in a future post. And finally, there’s context. These blocks don’t stand in isolation – they are, rather, the culmination of many blocks of beautiful houses on lovely streets. The beauty of these streets is enhanced in the mind by the knowledge that you can’t take a wrong turn off of them. Any way you go, you will be further rewarded. A small book could be written on the history of 500 & 600 Fullerton. 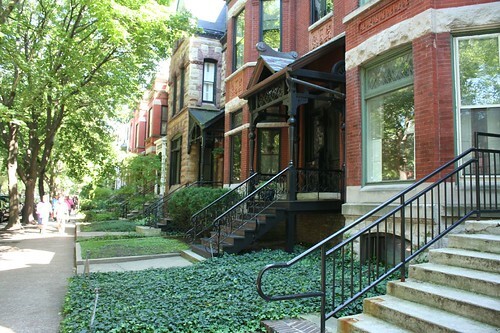 The addresses appear with high frequency in the social pages of the Chicago Tribune, in the who’s who books of turn-of-the-century Chicago, and in the city’s 1990s inventory of its historic resources. 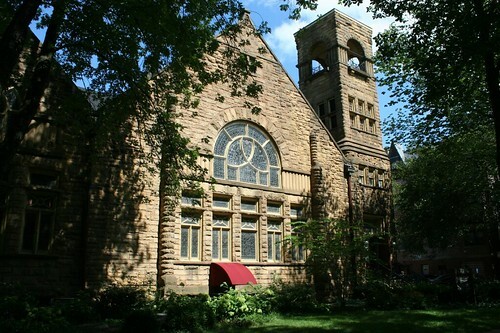 Remarkably, they do not appear to be part of a National Register district, despite the proximity of the Sheffield Historic District – possibly the neighbors declined to be registered. 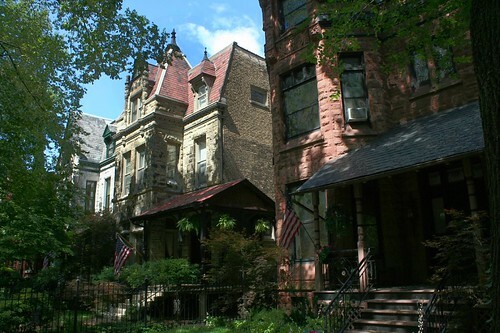 This entry was posted in Chicago neighborhoods, Fullerton Parkway, Victorian architecture. Bookmark the permalink. Living at 646 W. Fullerton in the early 1970’s ,I agree that those blocks are the most beautiful in all of Chicago. 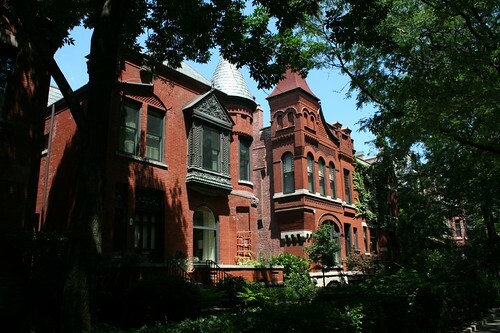 The lovely structures and the canopy of trees always made me happy to come home after a long day of work on LaSalle St.